If you have ever felt like it is hard to keep up (and I know I have) then this book is for you. 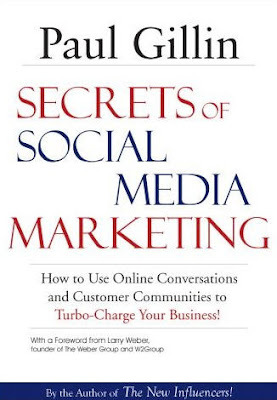 Admittedly, Paul Gillin wrote this book for the 90% of marketers still trying to figure out social media, I can tell you it makes and excellent resource for even the most polished social media expert. Paul covers topics like how to sell your social media program to by making a strong case, how to be a good listener using DIY tools across many types of media, how to find and court influencers, how to make social media worthy content and measuring results. I was lucky enough to get an advanced copy of his book and really enjoyed reading because it gave me ideas I can put into play immediately. Check out my podcast with Paul as we discuss some of the Secrets of Social Media Marketing. Paul is a veteran journalist who’s always been fascinated by the leading edge of technology innovation. Paul is a veteran technology journalist with more than 24 years of editorial leadership. Paul was founding editor-in-chief of TechTarget, one of the most successful new media entities to emerge on the Internet. Previously, he was editor-in-chief and executive editor of Computerworld . Currently, he writes the social media column for BtoB magazine. His critically acclaimed new book,The New Influencers, is about the changes in markets being driven by the new breed of online publishers. Published by Quill Driver Books in spring, 2007, it is in its third printing. His second book, Secrets of Social Media Marketing, will be published in the fall of 2008. Paul specializes in advising business-to-business marketers on strategies to optimize their use of online channels to reach buyers cost-effectively. He is particularly interested in social media and the application of personal publishing to brand awareness and business marketing. Paul is an accomplished speaker and media spokesman. He has keynoted more than a dozen technology conferences, including annual user group meetings for IBM, Oracle, Cognos, Business Objects and J.D. Edwards. He has also spoken at scores of other events about technology trends and social media. His ability to translate complex technology topics into plain English has made him a favorite source for journalists. He has been widely quoted in newspapers and on the airwaves, including appearances on CNN, PBS, Fox News and MSNBC. Paul is a research fellow at the Society for New Communications Research and he chairs the social media cluster of the Massachusetts Technology Leadership Council. He blogs at www.paulgillin.com. The book is intended for marketers and business owners who are trying to understand and leverage the power of new media for business benefit. I was looking for good social media marketing book. Thanks for the information. Can i have that at any book store besides amazon? Today’s generation has paved the way to the creation of better marketing strategies and tools (like twitter and other social book marking websites-social marker). No matter what other people call it, it is still marketing; Marketing products and services but in a convenient way. The information about the secrets of social media marketing is very helpful for me…Thanks….